Welcome to “11 Questions with…”. This edition’s guest is Meri Temudo. I am Meri Temudo, mama to two very active boys (8 & 10 yrs) and our tiny Chihuahua, and wife to an always working hubby. Since leaving my past jobs as a freelance broadcast designer for CTV and Daycare worker to care for my littles, my roles in both life and purpose have changed dramatically but have also almost made a full circle. My workaholic lifestyle became too much to keep up with once I had my firstborn, so I decided to take it down a million notches to stay home and care for the kiddos instead. Seems mama has a tad bit of helicopter parent in her (who knew) so I became devoted to molding my entire lifestyle to make the lives of my little men as fulfilled as possible. When my second son came around I still longed for an outlet and lil-sugar.ca was born. Initially I blogged for fun, and found a lot of connections via social media with like minded people to pass time with. A few months in and I was approached to do social media strategy for a company called PTPA Media, even though I was fresh I was motivated. Soon I was swinging a real job from home and the kiddos with ease, and since leaving PTPA Media last year, I still remain in media today. I manage to write for various online communities, as well overlook a few social channels, and keep lil-sugar.ca a float too. Turns out I now have more time since kids are in school full time right? Enter workaholic mode once again! My husband, Johnny works in the restaurant business along side my dad and brother-in-law and works late nights so I almost never have him home in the evenings. We often joke about me being a single parent but the truth is, I was raised this way and I really don’t know any better – besides how else would I get everything done? Johnny is patient, sweet and super soft spoken and attentive, everything I am not. I guess that’s why we’ve been married for 12 years. He hates social media, and prefers a good book or a walk in nature over a computer or television screen any day, so I never have to fight for the tablet or remote – bonus! A loving father to our boys and an inspirational role model to the men they will become. I don’t use my children’s real names on my social channels simply because they are unique and most probably traceable so I often refer to our oldest as ‘cookie’ and our youngest as ‘neigh’ – meanings with origins that came out of nowhere really. Cookie is our bold, fierce and stylish 10 year old with a personality bigger than himself. He is bright beyond his years and lets you know it too. Everyone who knows him gravitates to his energy and there is no doubt they never forget an encounter with him. He came into this world with purpose and is proving that he will fight his way through to achieve it. Little Neigh is actually not as little as we make him out to be – he has now surpassed his older brother in height and will continue to be just that, our gentle giant as we call him. He has a heart of gold, he is sweet, sensitive and super nurturing. This boy is the type of child that everyone wishes they had – passive but not the type to be pushed over. Guess it’s safe to say that these boys are uniquely different both in appearance and personality. One thing’s for sure though, they are both bold, strong and very self-aware. These traits I hope they keep forever. Before the kiddos came along life revolved around our tiny Chi Pharaoh. This pup was outfitted in designer duds, slept with us and even came to work with me most of the time. He was all that we could think about, our first baby. Pharaoh is now almost 12 years old and feeling it, he has developed diabetes and is now confined to a ‘condo’ lifestyle because his vision is deteriorating. His diabetes means that we have to feed him at the same time every morning and evening and administer insulin via a needle 2x a day to keep him regulated. My heart breaks for him daily and it is hard to keep him in our everyday activities now. He is a lot of work these days, but we love him just the same and he is the best for cuddles just before bed. Letting go has got to be my hardest parental challenge – helicopter parenting is hard when they get older. Cookie is now at the age of wanting independence and I am somewhat struggling with wanting to give him the experiences of growth and wanting to shelter him from future pain and suffering. I keep reminding myself that he has to grow or he will hate me forever – secretly I know this is true but taking the steps is hard. If only they could stay small forever. Perhaps some kind of archaeologist, fascinated by travel and history. I would love to do that for a living. My parents are my biggest inspirations. They were married young, had me at 18 and still managed to keep it all together and love each other unconditionally. They are strength, and balance – my best friends. Ha! Does anyone ever actually balance it all? I do have a no cell phone rule while the kids are around on week days and I find that helps with my time with them. The phone goes off when I pick them up and I resume when they are asleep at night – helps me focus on family time versus online time. The rest is all schedules, meal planning and a lot of organization and boxes! Breathe. Just breathe because no one has it all together. Tomorrow is another day, and today will never be relived. Your kids are their own people – let them be who they want to become. Always follow your gut, chances are it’s right. 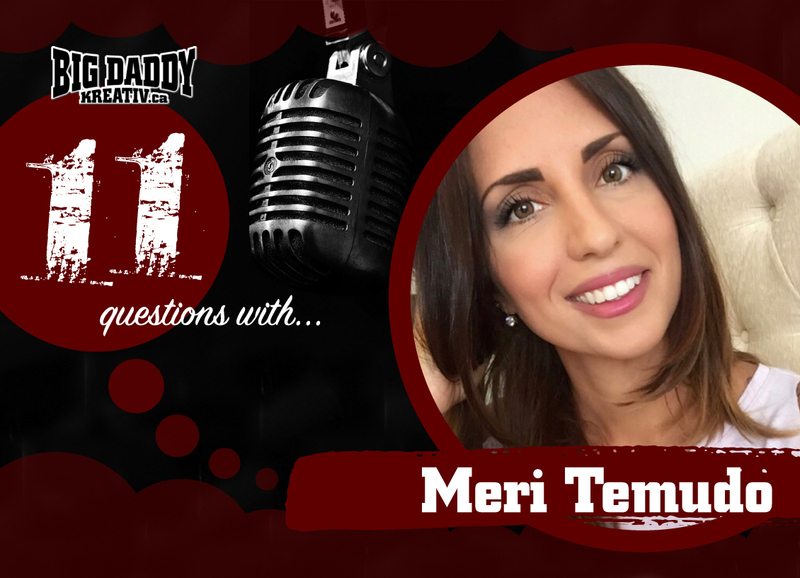 Get social with Meri Temudo! Be sure to visit Meri Temudo’s blog, and follow her on Twitter, Facebook and Instagram.